The client had inherited a building that had been poorly managed and was beginning to attract complaints. Our initial brief called for a rapid consolidation and refurbishment of the terminal’s image and amenity including interiors, immediate exteriors and platforms. We determined to unify the sprawling and disjointed site, define it’s edges and to connect the terminal to it’s surrounding environment using the rich red orange rock colours of the MacDonnell Ranges. 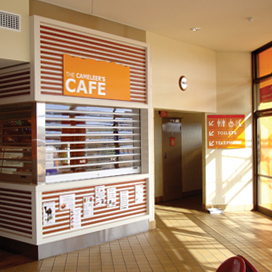 We applied a site wide colour plan consistently to interiors and exteriors, extensive new signage, new furniture and new barrier fences to pull the site presentation together and provide for an increased level of amenity. To achieve a sense of arrival we established a new icon sign to reinforce the town name, the location in central Australia, the connections with The Ghan train and, after a journey of up to 24 hours, to let the passengers know that they had indeed arrived in the “centre”.